Following the monumental, billion-dollar success that was the previous 007 cinematic installment called Skyfall, the iconic secret agent suits up for his 24th mission on celluloid to present the most lackluster spy blockbuster of 2015 and perhaps director Sam Mendes’ (American Beauty, Jarhead) worst film to date. That being said, the newest James Bond tale has merit, however, one mistakenly expects the same man who shot Skyfall to at least match the quality of his last Bond flick. It appears as if Mendes showed all his moves in 2012, using Spectre as a culmination film for the Bond/ Daniel Craig reboot movies that began in 2006 with Casino Royale. If the most recent Bond movie winds up as Craig’s final performance, the actor leaves a legacy of alternating spectacular and mediocre entries as Spectre errs on the side of Quantum of Solace—trying too hard to intricately connect the greater franchise. Viewers praised Skyfall for creating a deeply personal mission that equally tested Bond’s loyalty to M and MI6 in the process. Oscar-winner Javier Bardem played a critically-acclaimed villain while popular characters Q and Moneypenny finally met their reboot. Spectre attempts to do the exact same thing on a much grander scale. Two-time Oscar-winner Christoph Waltz (Django Unchained, Inglourious Basterds) plays the eccentric villain with personal ties to Bond’s deep and recent past, also having a stake in MI6 somehow to better involve the new M, Q, and Moneypenny in the action. Unfortunately, the talented Waltz receives no help in his performance from the written dialogue with cringe-worthy lines such as: “I am the author of all your pain!” Bardem received a long, drawn-out opening speech in one take that explained a parable about tortured mice which served as a metaphor for the plot of Skyfall. One assumes Waltz hoped for the same attention to writing when he signed on for the high-profile film. The extended cast contains many talented supporting performers, but few really get a chance to create a dynamic beyond the “new” M, played by Academy Award nominee Ralph Fiennes (the Harry Potter franchise, Coriolanus). Like Skyfall (again), Mendes plays up M’s involvement in the action. Although no longer the villain’s target like Dame Judi Dench’s M, Fiennes grabs a pistol and a set of car keys to practically follow Bond’s example in the climactic sequence. M and Bond form a near Batman-and-Commissioner Gordon relationship as the legitimate enforcer has no choice but to join the rogue agent. Spectre also makes an interesting change of pace introducing the moral dilemma of global surveillance to the point where Bond’s true allies decide it best not to look into assisting him as they can’t trust the surveillants. Who watches the Watchmen, indeed? The females in the cast, like in most Bond films, have little written for their characters. Talented Italian actress Monica Bellucci (The Brothers Grimm, Shoot ‘Em Up) receives barely any screen time and ultimately amounts to an extended way for Bond to initially land on the bad guys’ radar. Rising French actress Léa Seydoux (Mission: Impossible—Ghost Protocol, Robin Hood) receives a little backstory with ties to one of Bond’s former foes, but her romance with the assassin gets stereotypically rushed as she really just becomes another third act damsel in distress. Thankfully, British actress Naomie Harris’ (28 Days Later, Pirates of the Caribbean: At World’s End) Moneypenny appears as at least one liberated woman in the plot. Without ruining the minor details, the new Moneypenny doesn’t sit around waiting for James Bond day and night to ride in on a white horse. Swiss cinematographer and two-time BAFTA-nominee Hoyte van Hoytema (Interstellar, Tinker Tailor Soldier Spy) joins the franchise. Van Hoytema provides one of Spectre’s few improvements to Skyfall with wide, tone-setting shots that simultaneously establish a location and evoke a mood—especially seeing Bond sail a little boat in a huge Austrian lake. The director of photography’s work shines particularly in the opening, pre-title sequence in Mexico City during the famous Día de los Muertos (Day of the Dead) holiday festivities. Long, tracking shots follow Bond along the city’s historic rooftops, beckoning the rooftop chase from Coppola’s The Godfather, Part II with Robert De Niro’s Vito running across the buildings of old New York. Can Daniel Craig turn in a poor Bond performance? It looks doubtful after Spectre. Despite the aforementioned poor writing, Craig has clearly learned how to keep all the 007 rhythms after playing the character for nearly a decade now. At one point, an ally offers the spy a hand to get out of a boat while Bond steps up to the dock, looking puzzled at the man after rejecting the gesture as if to say, “I’m James-f’n-Bond, the stereotypical male fantasy, why would I need help out of a boat?” The movie could have unhinged a lot worse due to the predictable plot and easy dialogue—especially after production costs blew up the budget—but Craig’s stoic performance reins in the Hollywood madness to keep the viewer invested in Bond’s situation. 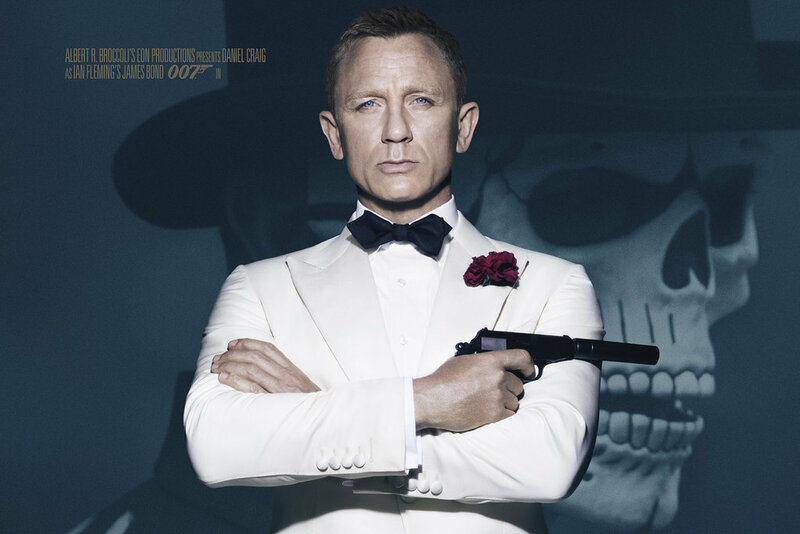 Despite a bloated runtime, poor character development, poorer dialogue, attempting to make a bigger version of Skyfall, and the cheesiest opening title sequence in over two decades (the tentacles are too uncomfortable), the newest 007 film still hits a few marks to give value to the price of a ticket. The overall aesthetics look phenomenal thanks to the keen eye of cinematographer Hoyte van Hoytema. Daniel Craig keeps his string of strong performances intact in Spectre, reminding audiences and critics why many consider the current 007 actor as the greatest to order a vodka martini shaken, not stirred, on screen. In a year that saw Kingsman: The Secret Service, Mission: Impossible—Rogue Nation, The Man From U.N.C.L.E.,and even Spy, the James Bond movie winds up the most forgettable spy movie.